Everyone's going organic and we are too! In addition featuring Applegate Farms Organic Uncured Dogs, we also feature natural, kosher and locally made hot dogs. Organic hot dogs are even better when you add local organic condiments! Most of our condiments are made with farm fresh, natural and organic ingredients from local farmers and producers, and we post their names nearby so shoppers can see how they were made. Locally made 100% all-beef hot dogs served in a hot steamed bun, and slathered with any combo of freshly diced onions, sweet pickle relish, spicy mustard, sauerkraut or tomato ketchup (chips & soda included). Organic Hot Dogs by Applegate Farms - 100% grass-fed lean beef low in saturated fat, high in omega-3 fatty acids and made without other stuff like: nitrates, nitrites, antibiotics, hormones, gluten, casein & animal by-products. Double-Dawg Special - Two Ballpark hot dogs served in hot steamed buns and topped with any combo of freshly diced onions, sweet pickle relish, spicy mustard, sauerkraut or tomato ketchup (chips & soda included). Old School 100% all-beef hot dog served in a hot steamed bun and topped with Franky's Hot Dog Chili Sauce, creamy melted cheddar cheese, freshly diced onions, spicy mustard & sweet chili pepper relish (soda & chips included). This quarter-pounder is the best tasting 100% all-beef natural casing frankfurter ever. Served in a large hot steamed bun with your choice of freshly diced onions, sweet pickle relish, spicy mustard, sauerkraut or ketchup (chips & soda included). A large simmering sweet and juicy Italian sausage served in an oversided hot steamed bun and topped with sautéd green peppers & onions and creamy dijon mustard seed and viginerette sauce. Sweet and tender chopped New England Sea Clams, diced potatoes, celery, onions, herbs & spices, all simmered in a rich creamy broth and served with oyster crackers. Chinese Chicken Wings - On the Fly! Franky's Asian offering of 8 chicken wings marinated with ginger, sesame oil, garlic, scallions and other exotic herbs & spices (Made in the USA!). 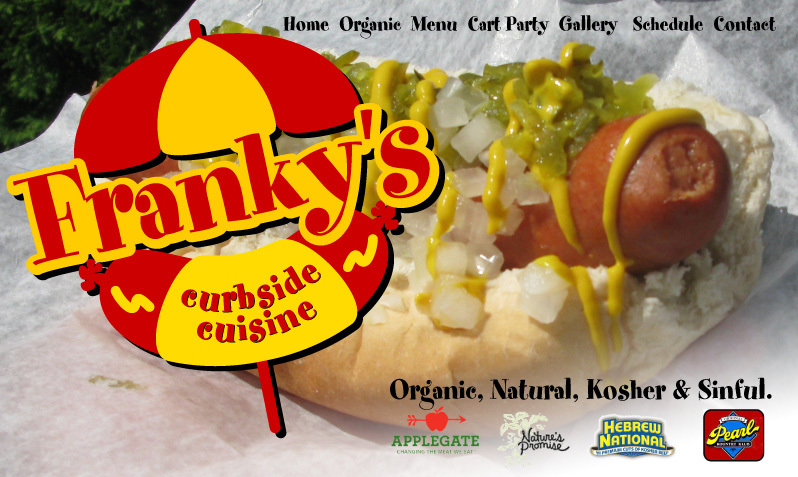 Franky's Curbside Cusine is a Massachusetts Certified Kitchen Safe Food Management Vendor. The consumption of undercooked meats, shellfish, poultry or eggs may increase the risks of food boune illness. Franky's Curbside Cusine is made with farm fresh and organic ingredients from South Shore Farmers & Producers (where possible).